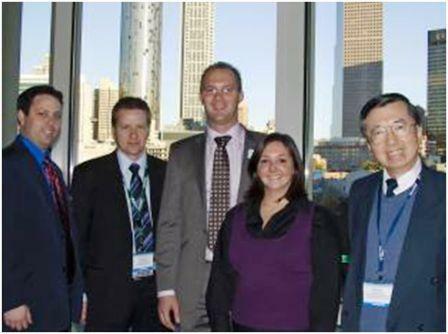 December, 2008 – The 2008 annual AAPS (American Association of Pharmaceutical Scientists) meeting in Atlanta Georgia provided the backdrop for a workshop entitled ‘Powder Flow & Process Analytical Technology – Tools for Implementation of QbD’. Christina Pattoni from Pfizer spoke about her team’s use of the Freeman Technology FT4 Powder Rheometer, while Stephen Closs from Patheon shared his experiences of using the C-Therm ESP Thermal Effusivity instrument, and Stephen Wu of Covidien talked about both technologies in respect of work with pharmaceutical lubricants. Each presentation prompted lively debate, highlighting the many challenges people share when it comes to successfully processing powders. The event, co-sponsored by C-Therm Technologies and Freeman Technology, attracted participants from over 20 organizations in the pharmaceutical industry and provided an atmosphere to gain a greater understanding of different formulation and PAT tools to facilitate QbD. Established in 2007, C-Therm Technologies Ltd., located in Fredericton New Brunswick, Canada, provides non-destructive, thermal sensor technology solutions for R&D, production and quality control applications. The patented platform technology delivers fast, accurate measurement of thermal conductivity and thermal effusivity in seconds. To find about more about C-Therm Technologies Ltd. products and applications, visit their website at www.ctherm.com. A specialist company that has pioneered the measurement and understanding of powders and their flow properties. Freeman powder rheometers are installed around the world in a diverse range of industries, including chemical, pharmaceutical, toners, foods, powder coatings, metals, cosmetics and many others. To find about more about Freeman Technology Rheometer and applications, visit their website at www.freemantech.co.uk.